It looks like the news surrounding Lamar Odom's hospitalization after he was found unconscious at Dennis Hof's Love Ranch South brothel in Pahrump, Nevada, might finally be taking a turn for the better. According to E! News, the former NBA player is reportedly no longer comatose, and is actually responsive — to the point that, according to CNN, sources actually claim he spoke to estranged wife Khloé Kardashian, who has been keeping vigil at his bedside. Though E! Online's reports stress that these alleged updates on Odom's condition don't mean he's "out of the woods" just yet, it's definitely amazing to hear. Since his hospitalization, many have been eagerly awaiting news that Odom would become responsive — and thankfully, reports have begun to state that he has. On Friday, Odom’s aunt, JaNean Mercer released a statement to Us Weekly stating that Odom "gave a thumbs up to the doctors this morning and said a few words to them." According to CNN and E! Online, a "source with knowledge of the situation" reported that Odom was conscious enough to tell his estranged wife Kardashian "hey baby," and give her another thumbs up on Friday afternoon. E! Online reports that Odom is no longer using a breathing tube, which means that he's allegedly conscious and breathing on his own (with the help of a breathing mask, reports ESPN). Although that same report claims that he is still in critical condition, these are good signs. 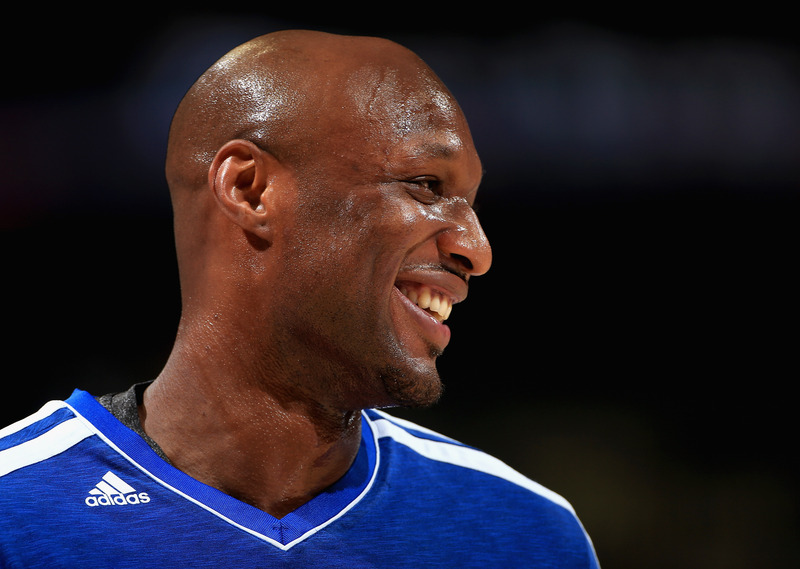 Early Friday, TMZ reported that Odom's heart "is on the mend," and that this is a huge sign of improvement. E Online also reported that Odom had a normal EKG test, and that his heart rate and blood pressure are reportedly stable. Even though things are looking up, there's still much healing that needs to be done. According to CNN, Kris Jenner (Odom's estranged mother-in-law) told Access Hollywood on Friday that Odom's vital organs remain in critical condition. As of Friday evening, E! Online reported that Odom is experiencing kidney failure, and that the any extent of the damage to his brain won't be completely understood until he's fully awake. Soon after hearing of Odom's condition, Kardashian flew in to see her estranged husband. Odom's father, his two kids, and their mother, Liza Morales, have also been by his side. According to E! Online, Kardashian hasn't left his bedside and is reportedly still making all of the medical decisions — the site even claims she's the decision maker when it comes to hospital visitors. Although E! News reports that it seems Odom is not completely out of the woods just yet, his conditions have reportedly vastly improved. Stay tuned for more updates on the NBA star's health. Bustle has reached out for comment in response to reports of Odom's condition, but has not yet heard back.